By now, it's almost cliche to say that data is everywhere. That's because it really is. Whether you're a statistician, a biologist, historian, or even a high school student— you're inevitably going to use data. But tools to analyze this data are either too complicated to use or too simple to be of use. That's where we got our inspiration, that with the advent of powerful conversational AI, we can empower people to take control of and analyze their datasets. A.I.D.A.N. stands for 'AI for Data Analysis, "Now!"'. We provide a radically simple conversational interface for users to work in very sophisticated ways with their data. 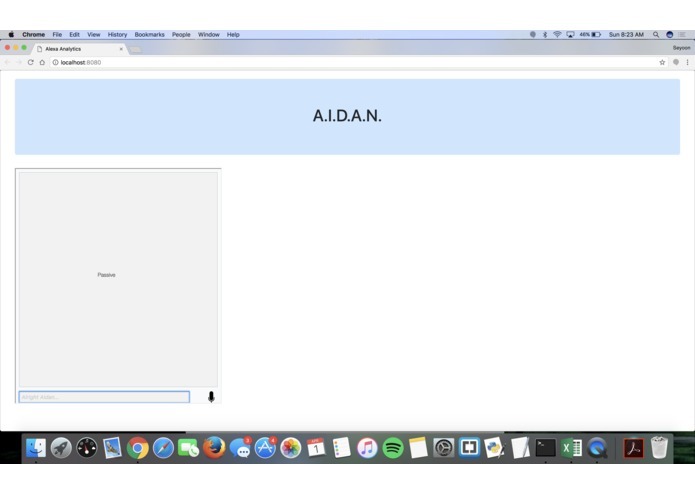 The user can upload their own dataset (currently in .csv file format), and we then take them to an easy-to-use interface where they can converse with AIDAN. As an example, the user might ask AIDAN to "fit a best-fit line for house price and number of bedrooms". 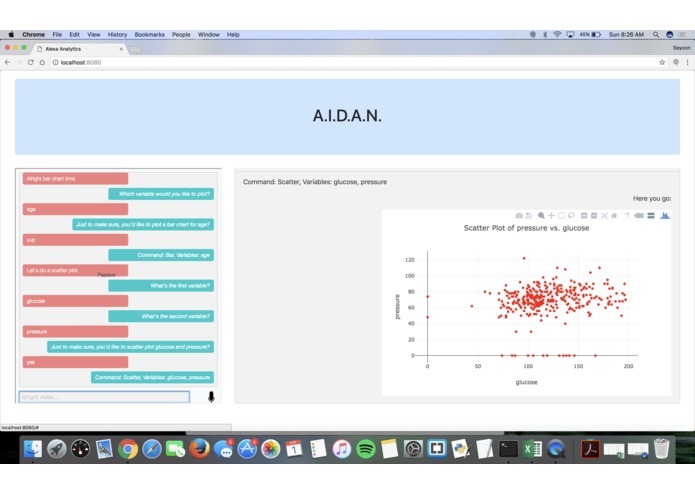 AIDAN has a friendly conversation with them, and then processes the request and displays the regression equation and plot to the right of the chat window. 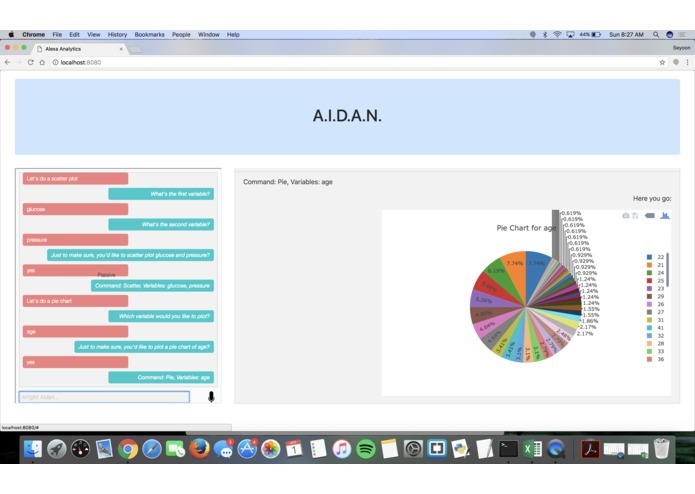 As they continue to converse with AIDAN, the plots and statistics they request appear on the right in a dynamic, notebook-like format. 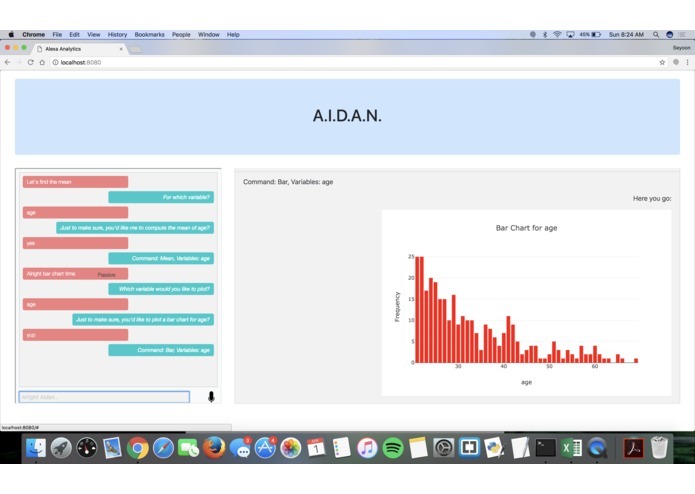 AIDAN supports a lot of functionality, including one and two-variable statistics, data visualization, and machine learning. 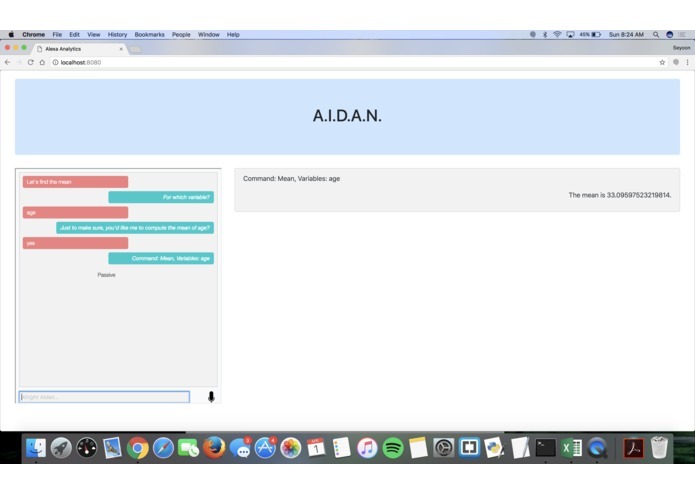 In addition, we allow the user to converse with AIDAN using either text or their voice, as well as the ability to interact with the plots (zoom in, hover, etc.) and export them in standard image formats. We have also built in contextual understanding for the voice option, such that we can still understand the intent of the user even if speech recognition does not interpret the user entirely correctly. We built the frontend using React.js and integrated the chatbot into our frontend. For the data analysis, we wrote the data visualization functionality using plotly.js and the machine learning capabilities using mljs. Integrating both voice and text capabilities into the chatbot was quite challenging, since they require different APIs, and we're proud of being able to support both. 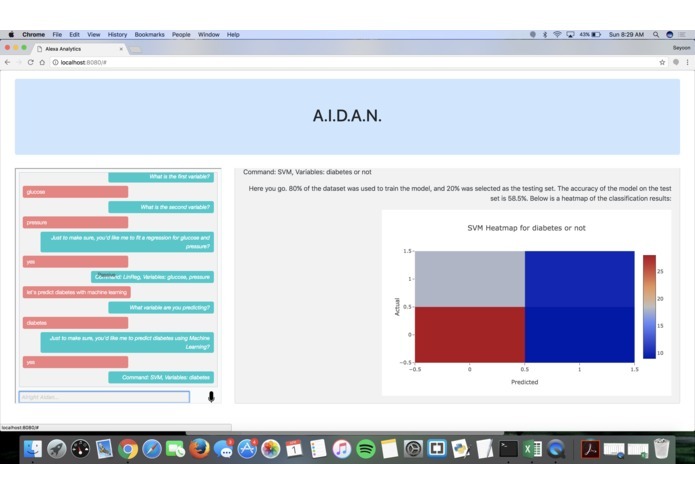 We were also happy that we were able to create a wide range of functionality for AIDAN, from plotting to ML, while still keeping a relatively friendly, conversational flow. And of course, actually talking with AIDAN and seeing the whole project come to life was also a pretty awesome moment. On the technical side, we learned a lot about AWS (since none of our group members had previous experience), designing chatbots, and working with React. We also learned how to effectively parallelize work, push through frustrating bugs, and how to adapt and make practical decisions about the direction and architecture of the project. 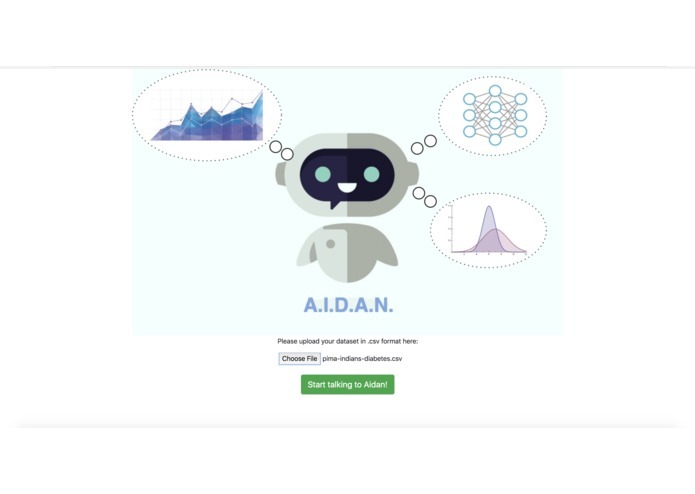 What's next for A.I.D.A.N.— A.I. and Data Analysis, "Now!" We're super excited about the future of AIDAN, since there's so many ways to expand on what we've done. 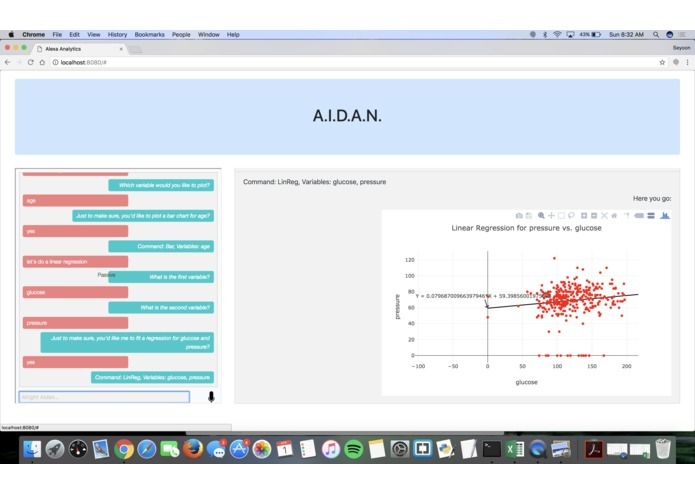 We'd first look to increase AIDAN's capabilities, adding more advanced data visualization and machine learning functionality. In addition, we would expand to different file formats, as well as possibly offer data 'arenas' that are personalized to specific fields (e.g. biology, social sciences). There's a lot we can see ourselves doing. I worked on developing the chatbot AI and integrating the chatbot with the React frontend. I worked on the front-end, using ReactJS (with Bootstrap to help format the app nicely) and also worked with the others to adapt their code to ReactJS syntax as needed. I helped integrate AWS Lex voice and audio technologies of the chatbot with our React frontend and extracting the user's chatbot commands for the analytics end to process and interpret. I worked on the statistical, graphing, and machine learning methods behind the website.